I have used two and three blade props on .020.049 & .051. It's there any hard evidence to prove if the three blade pushes more air than a two blade. I think almost the same? Three blade props give more thrust than two blade props, at least I know. The more blades, the more of the crankshaft power can be transferred to air. An exception would be very high-rpm speed engines, where a single blade is sometimes used. Two or more blades would interfere each others’ air flow and reduce the speed. One blade always works in as calm air as possible. 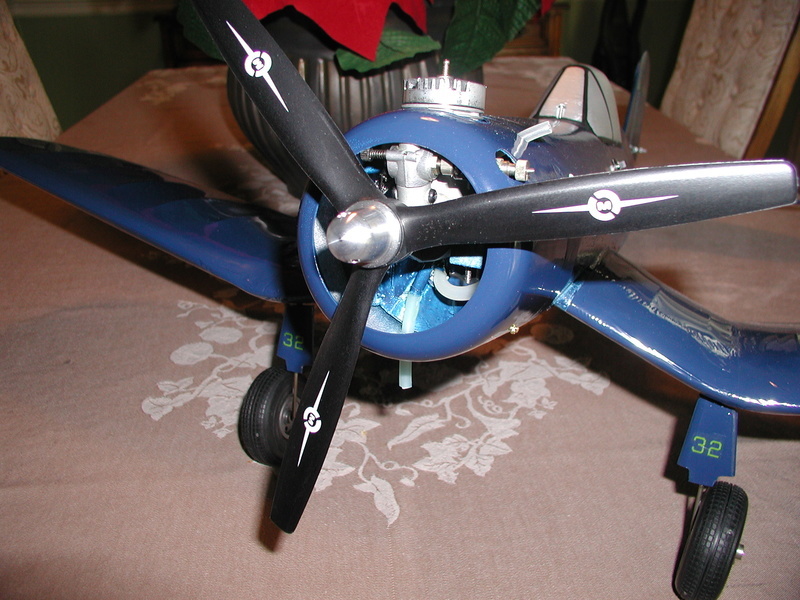 The WW2 F4U Corsair went from a 3 blade propeller to a 4 blade with the introduction of the F4U-4. Better performance and reducing the overall diameter helped landings and takeoffs. I have read that it allowed the landing gear to be reduced in length, but find no documentation to support this. 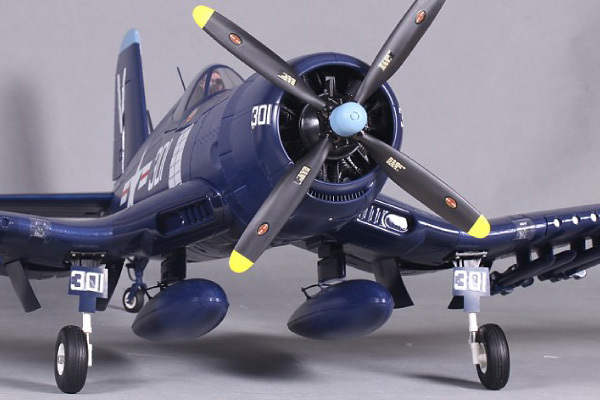 The F4U was the only piston powered fighter to down a MIG 15 Jet in Korea. i'm not an aeronautical engineer, but i have 50 years of modeling experience and some common knowledge. I guess i'd start with a clarification of your question, a prop doesn't move a plane so much by pushing air, its does by the prop creating lift (forward) the plane goes along for the ride cause its attached. Multi blade props are designed primarily where diameter is an issue...and at this point i'll let the engineers jump in. Most use two blade as its the most effective for cutting into the air, some speed props are only one blade. I'd think the practical assessment that more blades allows a smaller diameter prop is the reason for 3 or 4 blades (or more as in say, an unducted fan - remember the DC-9 study back in the late 1980's? Never gained traction because fuel prices that spiked dropped making it economically unappealing). Thing about the 2 blade is that one can get a larger diameter to move the air past the fuselage. A smaller prop is more effective with a narrower streamlined fuselage. 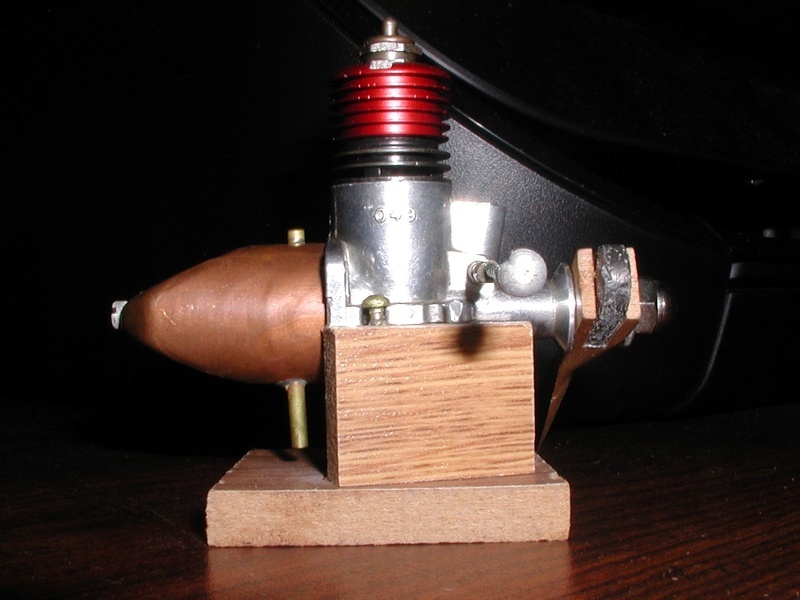 It's why an ignition .60 of 80 years ago putting out 1/4 HP (i.e., Brown Jr., same HP as a modern plain bearing .15 cross scavenge (i.e., Enya .15-III TV) of the 1960's or .10 sport Schneurle, i.e., OS Max .10 FP RC) could move a 7 - 8 foot (2 meter) wingspan cabin or pylon aircraft through the air. Turning a 14 to 16 inch propeller at 7,000 RPM could move those behemoths. 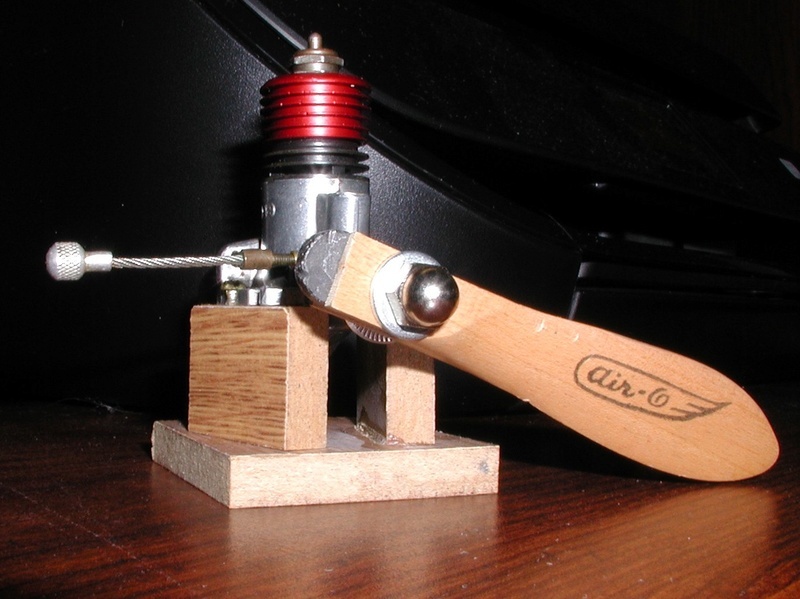 A .15 turning a 8 inch prop at 13,000 RPM or .10 Schneurle turning a 7 inch prop at 15,000 RPM would never cut it because those props don't churn enough air past the fuselage cross section. You got a rare one there, Bob. Is prop original, or was it modified after purchase? Always found those 1 bladed's to be a bit of mystery, think it was because it was only found in speed circles. I guess it was the cutting edge of taking the best advantage of technology to gain an advantage over contest competition. grrr....lol, yes, yes i do! I'm still looking for a least a tank!! Mark Boesen wrote: grrr....lol, yes, yes i do! I'm still looking for a least a tank!! Still figuring out your new avatar. Dukes guys rolling over the General?????? Guessing here, I never watched an episode. Prop came with the engine George. I dunno, Mark is the guy on these. They must have vibrated with single blade? I had the occasional twin blade snap one side while running. It practically vibrated my plane in half?? No, it is balanced, there is a lead counterweight on the non-blade side. Just jogged my memory of a single blade set up that I got 10 or so years ago from a mouse racer in Texas. It has a tear drop shaped brass hub that was also a counter weight to perfectly fit the orange KK LH race props. The KK props were not cut through the screw hole but biased to the side of the lost blade. The prop was perfectly balance even with the one blade radically shaved and narrowed. I'm pretty sure due the quality and fitment to the KK orange props, it may have been a KK product. Does anyone have info or recall such a thing ? Sorry for no pic due to my ignorance. BTW, Here's a heads up from some info I got last week from a couple of LHS regarding propeller availability. Seems there may be difficulties in getting glow props. Fortunately , I believe Bernie and Matt have access to new production Cox sizes, which is great since, otherwise, probably no actual Cox produced props have not been minted , in what, nearly 25 years now. Buy accordingly may be a wise move now.. Sorry for the rambling but a bad cold has me not thinking right. The Duke boys always slid over the hood in a hurry to save Daisy or foil some evil plan, wasn't a big fan of show, but saw enough that the photo just cracks me up. 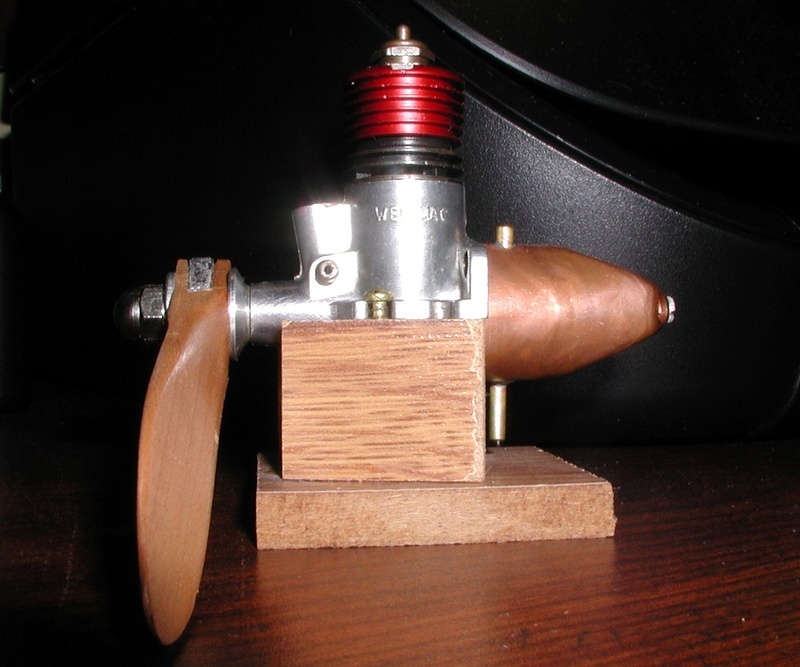 The prop didn't come with engine, but its period correct. I can't tell you if the prop is factory or somebody modified it, i'd lean toward the later as I don't see a market for speed props, but who knows, maybe Bill Mohrbacher does. I believe the brass stunt tank can with the first run of 'Hobby' version. If you look closely at outward blade/pitch sculpting root at hub area of prop it strongly seems that it came out of factory as a single blade prop. Does the single blade design have a strong front gyro effect? That is holding the front of the plane rock steady due to centrical force? If so maybe interesting for maneuverability?? ticomareado wrote: If you look closely at outward blade/pitch sculpting root at hub area of prop it strongly seems that it came out of factory as a single blade prop. Good point Victor, there is no corresponding relief there. Iceberg wrote: Does the single blade design have a strong front gyro effect? That is holding the front of the plane rock steady due to centrical force? If so maybe interesting for maneuverability?? The idea of the single blade was to help cut thru clean air (due to the higher RPM) gaining some efficiency, i.e. speed. » Soaking a propeller in water?